Protesters opposing Bill 14 demonstrate outside the office of Quebec Premier Pauline Marois. Graham Hughes/The Canadian Press. The PQ government’s horrible Bill 14 continues to embarrass this province around the world. This month’s Time Magazine exposes the narrow-mindedness of this discriminatory draft law. Cote Saint-Luc Mayor Anthony Housefather continues to play a leadership role in opposing Bill 14 and has been quoted in this article and several others across the country. We’re lucky to have him and other such as Town of Mount Royal Mayor Philippe Roy to speak up in defence, not only of the English-speaking population, but all Quebecers in favour of equality among citizens, a vibrant economy and a better, fairer society. 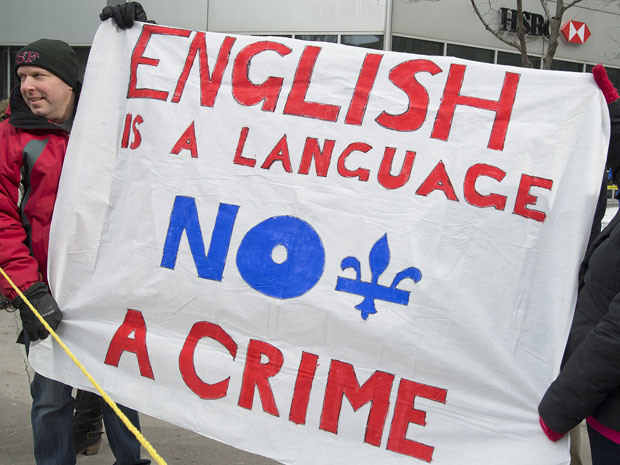 You can read the full article here: In Quebec’s War on English, Language Politics Intensify | TIME.com. Good for him..fight for your right’s!